The three-day Memorial Day weekend provided us with another opportunity to continue our house-raising party. 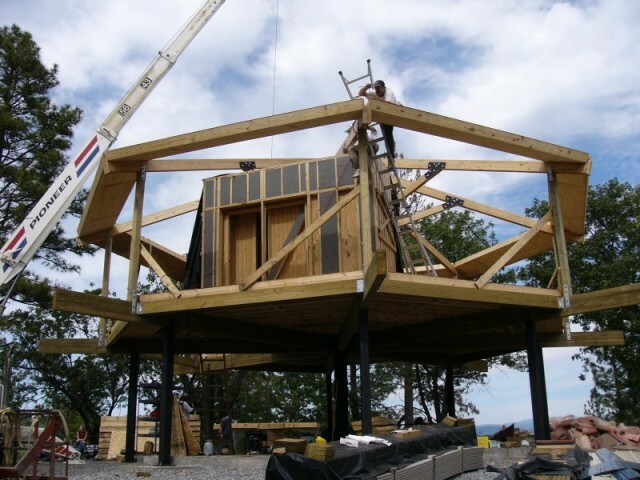 Gail's goal was to install the roof panels and begin erecting walls. Russell thought we'd be lucky just to finish the roof. We took two vehicles again due to the amount of equipment we had to transport up to the mountain. Russell took Friday off of work and drove up on the morning of May 27. Unfortunately, his early departure did not help him escape the traffic. The "East Bay corridor" -- the only way of getting from the San Francisco Bay Area to California's Central Valley -- is constantly congested, as more and more people commute from the outlying areas. Commute times of one to two hours are pretty standard. It was bad enough to leave on the Friday of a holiday weekend, but today had the additional problem of a huge traffic accident. 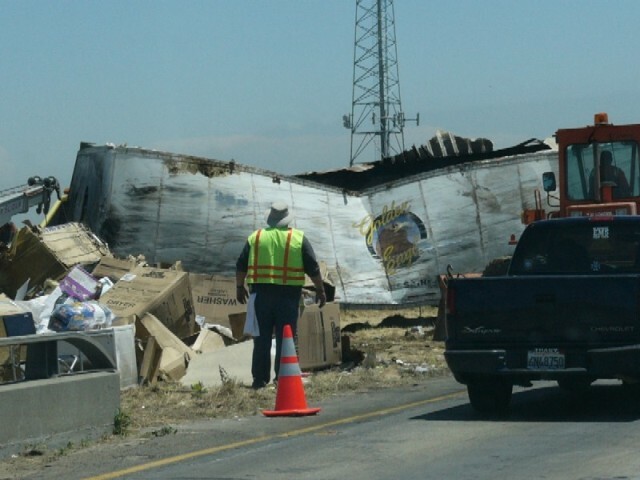 At 2:00 that morning a big rig had jackknifed and caught fire; at noon the traffic was still horrible. Cars were literally coming to a dead stop on the freeway to look at the burned out remains of the truck trailer. It took Russell four hours to get to Calaveras. During the evening commute, it would take Gail and the boys five hours. The first person to arrive after Russell was Steve S, one of his oldest (friendship, not age) and best friends from high school. Steve had been up here camping before, but missed our previous house building party when we cancelled the second weekend. Gayle and Charlie pulled up just as Russell and Steve S were driving off to have dinner (Chinese smorgasbord again). They would try tent camping this time. Gail, Cameron, and Joss did not arrive until almost 9:00 pm, but Russell had already set up the tents and kitchen gazebo. The good news was that the house skeleton was still standing. We had been concerned because of all of the wind and rain since our last visit. Last time before we left, we had covered all of our tools and equipment with a tarp. We had also put our stamped/approved set of blueprints, permits, and inspection cards into an ice chest (a suggestion from Dennis, the building inspector). As we uncovered everything, Gail suddenly let out an anguished scream. The ice chest, despite being fastened shut, was filled with rain water. Ironically, all of the tools were perfectly fine. But the paperwork that we cared the most about -- the paperwork that we had most critically protected -- was almost destroyed. 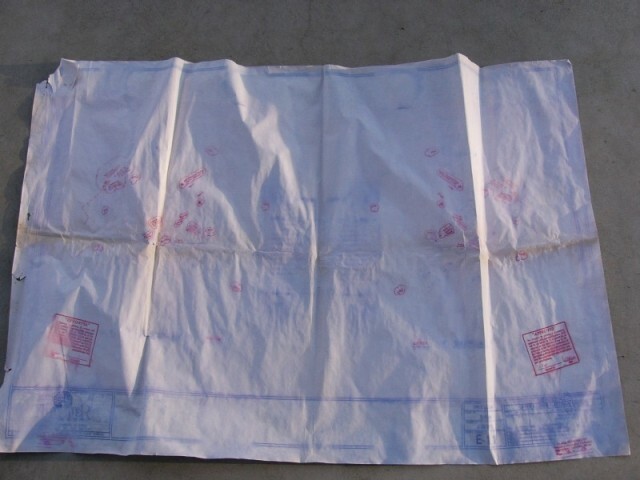 As we delicately laid the soaking wet sheets out to dry on the cement foundation, we discovered that all of the blueprint ink had washed off -- the only things still visible were the red ink of the approval stamps and Gail's hand-written notes. There is an old adage known as "Murphy's Law": "Whatever can go wrong, will." This would be just the beginning. On Saturday, May 28 -- our first full day of work -- Frank and his crane were scheduled to arrive at 8:00 am. In the meantime, we started work early to accomplish the first item on Russell's checklist: replacing the center column bolts. 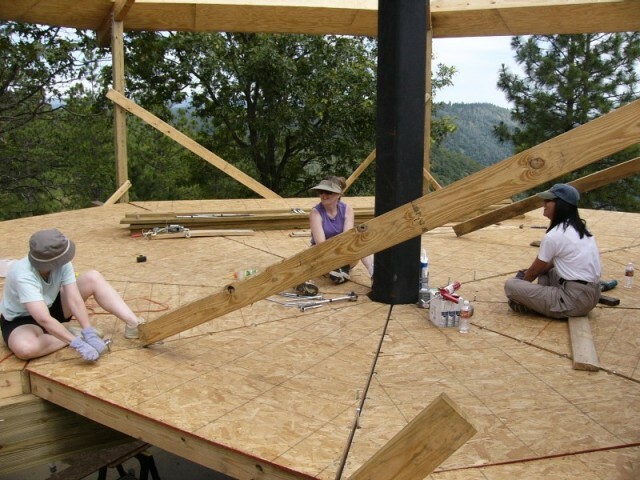 Back in April at our first house raising party, we discovered onsite that Topsider had provided the wrong bolts for the critical center column. 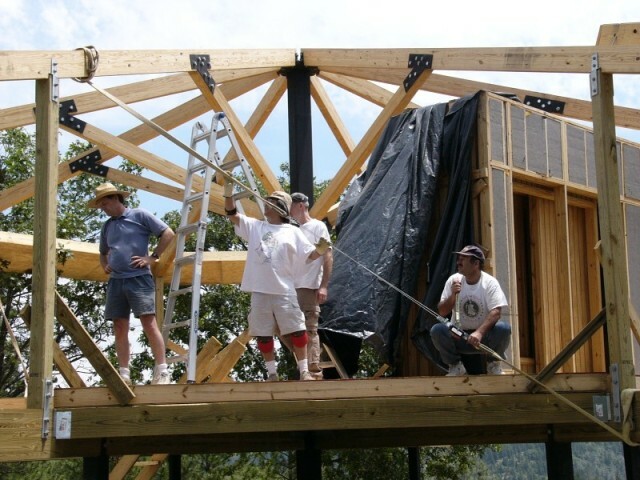 Rather than call a halt to the building before it even started, we decided to use the too-short bolts on a temporary basis to hold the beams in place. Now, we had the correct bolts, but we were apprehensive. The worst-case scenario would be if we could get the old bolts out but couldn't get the new ones in. This would mean dismantling the entire house. Fortunately, we didn't have a problem. There were a couple of bolts that had a difficult time fitting in, but a sledge hammer took care of that. With Frank's welcome arrival, we hit the next two items on Russell's list. The first item was tightening the rest of the skeleton with an impact wrench. During the last trip, Gail and Russell had tightened everything that they could reach with the ladders. Frank's crane would help us reach the rest. The second item was securing the roof truss end-caps with screws. Previously we had used double-headed toe nails; but Topsider's manual recommended screws, and we decided to play it safe. Matt hadn't arrived yet, so Steve S volunteered for the duty of hanging from the end of the crane in a basket. Matt, Joanne, and their children arrived soon afterwards. They brought Matt's father Virgil, Matt's sister Dawn, and Dawn's son Nicholas. (Virgil was visiting all the way from Michigan, and we were very excited about his presence as an experienced house builder.) They were in turn followed by Steve B, Debbie, and their son Eric. We split into several teams to handle multiple tasks. Now that the center column bolts had been replaced, we could finally fasten down the last of the second floor panels. We decided to use ten-inch lag screws instead of spikes. Russell started using the drill to make pilot holes, and immediately burned it out. Dawn and Virgil had to go into town (a half-hour drive away) to get a new one. 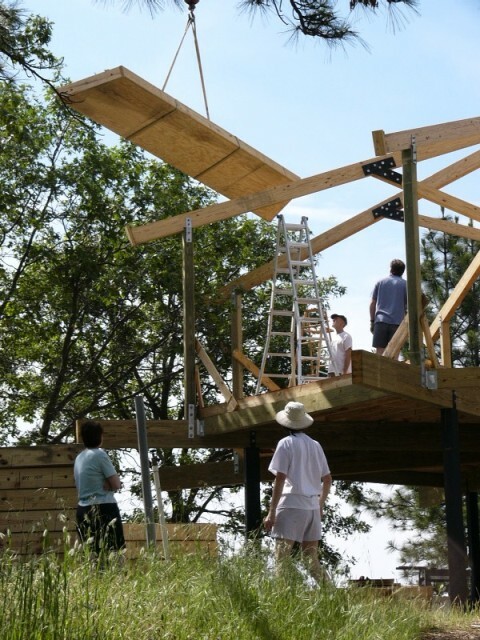 The remaining team worked with Frank and his crane to set the roof panels. The octagonal house has eight sides, and each side needs five concentric roof panels. This makes a total of 40 roof panels. We have no idea how you would lift these things into place without a crane, but four strong men can barely lift one off the ground, let alone 20 feet in the air (one of Topsider's instruction manuals says to use a forklift). Fortunately, we had Frank Gilbeau, the best crane operator in Calaveras County. 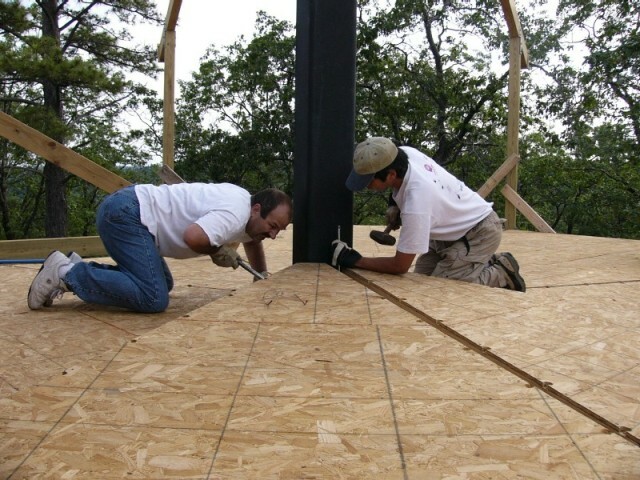 At the same time that we were placing the outer ring of roof panels, however, we had to accomplish another task. Yesterday morning, we had checked Topsider's many instruction manuals one last time. While poring over their latest manual (still in draft form), Russell saw an instruction that he had never seen before. 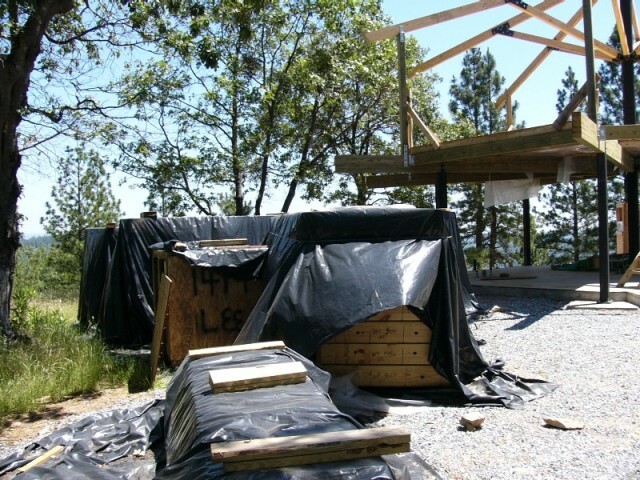 Apparently, we needed to install OSB plywood "spacers" all along the top length of every roof beam. Gail confirmed this with Topsider. Because the outer ring of roof panels had an extra layer of plywood, they were a different height than all of the other roof panels. Spacers would be necessary to compensate for this height difference. 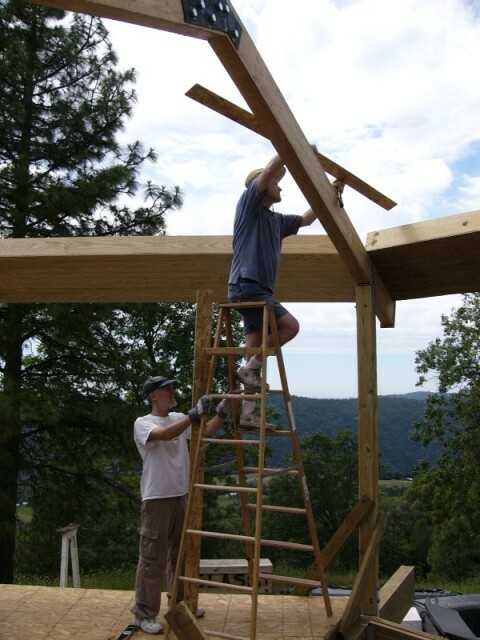 Of course, if we had known this before, we would have installed the spacers before we had installed the roof beams. 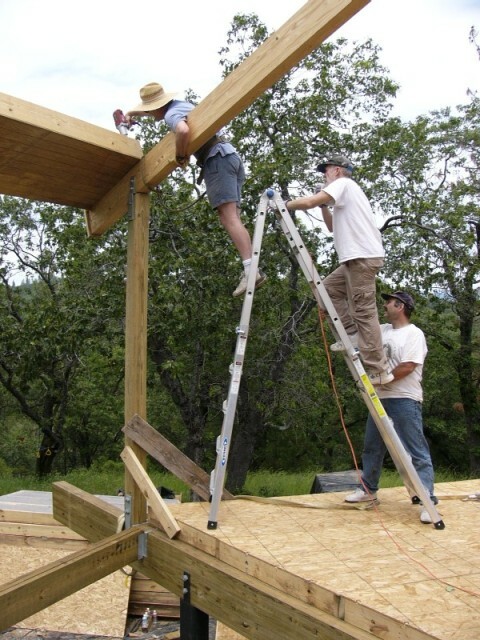 As it was, we would have to install them by ladder as we placed the roof panels. By lunchtime, we had successfully installed five out of eight of the outer ring roof panels. It was at this point that "Murphy" struck again. As the crane lowered the sixth panel into place, we discovered a horrible situation: it was not long enough to span the gap between the two roof beams. Construction came to a standstill as we pondered and brainstormed what to do next. 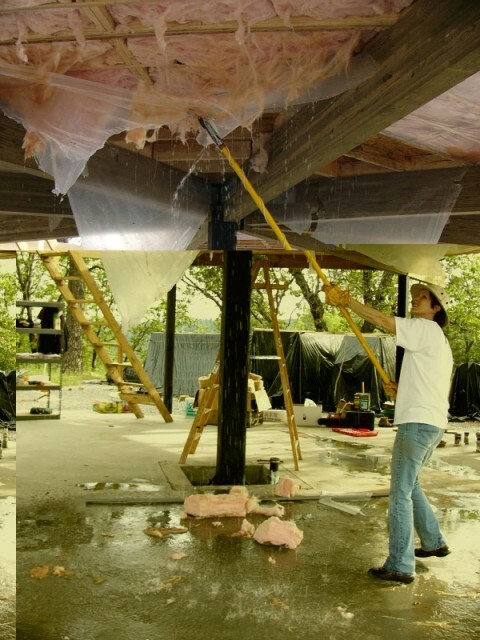 Were the roof panels different lengths? We measured them all; they were the same. For some reason, the gap between these two roof beams was larger -- and larger enough that the panel could not rest on top of the beams. At this point, there was not a whole lot that we could do. The floor panels had all been installed and spiked down; the upright posts were where they were going to be. We went around and measured the distance between each upright post. While most of them were 178" apart, we noticed a couple of odd pairs. One pair was 176" and 180" respectively; the other was 177" and 179" respectively. The only possible solution at this point was obvious. We would take these two upright posts out of plumb, and force equal distances of 178" on each side. We really had no other choice. The consensus was that the wooden upright posts would be able to tolerate a 2" lean without damaging any wood or structural integrity. After a break for lunch, Steve S brought out his comealong (Steve S had thrown just about every tool he had -- including those of his mother-in-law -- into the back of his truck before he had driven here). Using Frank's crane straps, we fastened one end to the top of the post that we needed to move, and the other end to the glu-lam beam on the other side. The plan worked perfectly. Using the comealong to hold the upright posts in place, we installed and screwed the panels in place. Matt, Charlie, Steve B, and Steve S use a comealong to force an upright post to move 2"
By the end of the afternoon, the entire outer ring of roof panels had been installed. It was time for "Murphy" to make another appearance. While drilling a lag screw pilot hole in one of the roof panels, the 12" drill bit broke in half. By this time it was too late to go into town again, so we called it a day. We had a wonderful dinner of barbecued chicken around the campfire. Afterwards, Debbie supplied another surprise -- but a pleasant one, this time. She had brought a cake in honor of Russell's and Gail's birthdays. 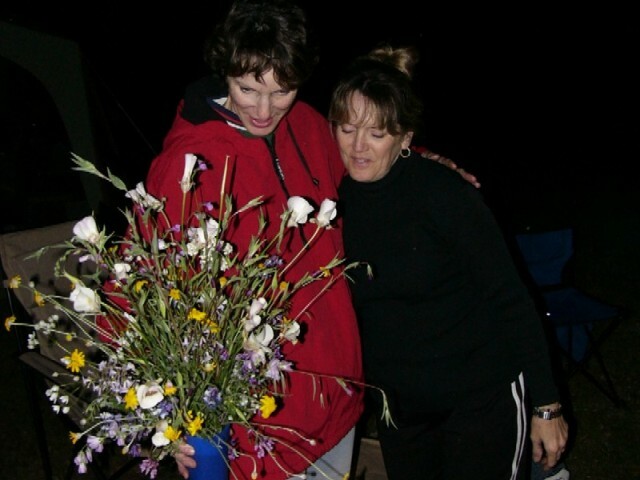 In addition, she had created a stunning birthday bouquet entirely from wildflowers that she had gathered around the property. After dinner, Matt volunteered for the last task of the day. He climbed to the top of the roof apex and nailed small pieces of wood -- "closers" -- to the ends of each roof beam. 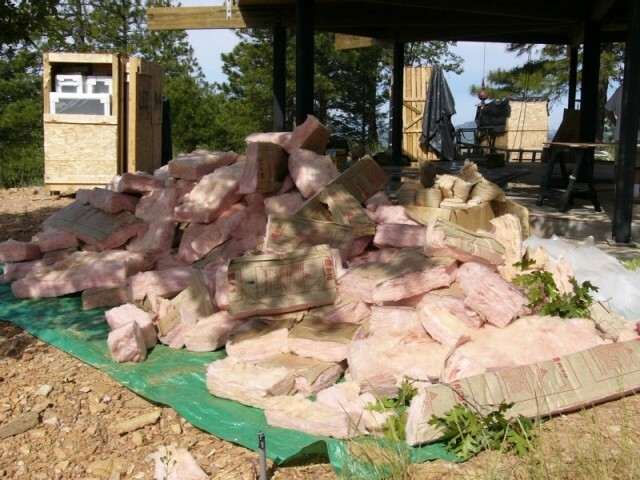 In the fading sunlight, we surveyed the results of a frustrating first day of work: eight out of 40 roof panels. How would we ever finish the roof by tomorrow? Everyone turned in early.